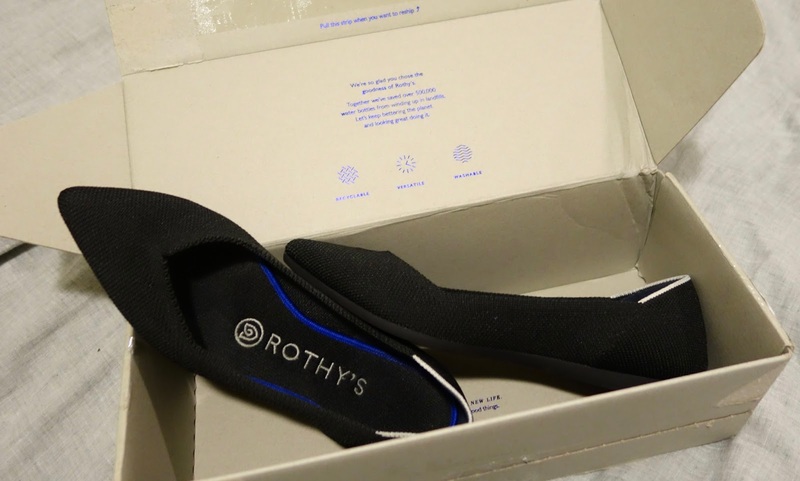 I stumbled across Rothy's as I was scrolling through reddit looking for shoe recommendations. I've been on the hunt for a comfortable pair that I could alternate with my Ferragamo Varinas because I've been wearing them out so much my cobbler has started giving me the side eye. It didn't take long for me to place an order because these shoes were pretty intriguing - they're made of recycled plastic bottles, are machine washable, and promise sneaker-like comfort. And they don't look half-bad either. It's almost too good to be true, but I've yet to see a bad review, so I took the plunge. They don't ship internationally yet, so I had to use a mail forwarder (I use ComGateway, and lucked out on a promotion and only had to pay six dollars for express shipping! ), but thankfully there are many referral links floating around in the interwebs (I have one too - link!) so I was able to get 20USD off my first order. They only offer two models - the flat and the point - albeit in a plethora of colors. I knew I wanted a black pair but I have this issue with round toe black flats (95% of them look weird on me for some reason - and this is not just me, I've asked people and they agree) so I settled on the point. Shipping took about two weeks total - one week from Rothy's to the mail forwarder and another week from the US to Singapore. I ordered a US6, which is the size I usually take in flats. There's a slight pinching in the toe box but not enough to cause discomfort (and can also be attributed to the pointed shape), so I would say run true to size. I have no idea how they managed to convert plastic bottles to a 3D-knit shoe, but it's pretty damn impressive. The material has just enough stretch to maintain comfort without looking sloppy, and because of the way the shoe is knit there are no rough seams (translation: no blisters!). You can supposedly throw the entire shoe into the wash (!!!) but the insoles can also be removed for more frequent cleaning. I've had them for a little bit more than a week now, and I have to say I am very, very pleased. One good indication of how much I like a shoe is how much time I have to spend talking myself out of wearing them on consecutive days (I try to give my shoes room to breathe after a full day of wear because I walk a lot and it's hot and my feet sweat because I'm human), and I actually failed because, well, they really went well with my jeans. (+) Comfort-wise, I have to say these are way up there as far as flats are concerned. I wouldn't go so far as to say they're like sneakers, because they offer no arch support at all, and I wouldn't go out and wear them to a marathon (actually, I wouldn't even go to a marathon, but that's a different story). But for a normal, ten thousand step working day, it's awesome. (+) I like that I can wear them to work without looking like I do casual Friday everyday. Flats have a tendency of toning down the formality of an outfit, but this is one of the few exceptions (although I guess I can't say that for the round toe model and the other colors). (+) So far they feel very low-maintenance - the knit is very sturdy, and when they get dirty I just do a round with a lint roller and they're ready to go. We'll have to see how they fare with machine washing, since I haven't reached that point yet. (-) Because of the stretchy nature of the material I can see the outline of some of my toes when I walk, which really bothered me at first. They're not as apparent now - either I got used to them or the shoe stretched out a bit - but if my feet were on the wider side this may be a deal breaker. (-) No international shipping (yet), so returns are going to be a hassle from this side of the planet if it doesn't work out. I'd have to wait and see how the wear and tear goes, but I'm keeping my fingers crossed. As it stands, though, it's taking my entire willpower not to order a second pair. P.S. My $20 referral code is: FRIEND-HHHL3MD or you can just click this link. Full disclosure: You get $20, I get $20 (and yet another reason to buy a second pair ;p).